NOW comes in a DOUBLE PACK! The magnets are pressure sealed with a waterproofing layer in between 2 layers of genuine leather. Leather, being a natural material minimizes sweating and is comfortable to wear, as opposed to similar products made with vinyl or elastic which may cause excessive sweating and the magnets to rust! The Rare Earth magnet at the back of the clip has a hole in it, wearing the clip dark side facing outwards and the magnet with the hole facing away from your body, you are assured that only the NORTH (Alklaine energy) of the magnet is in touch with your body. 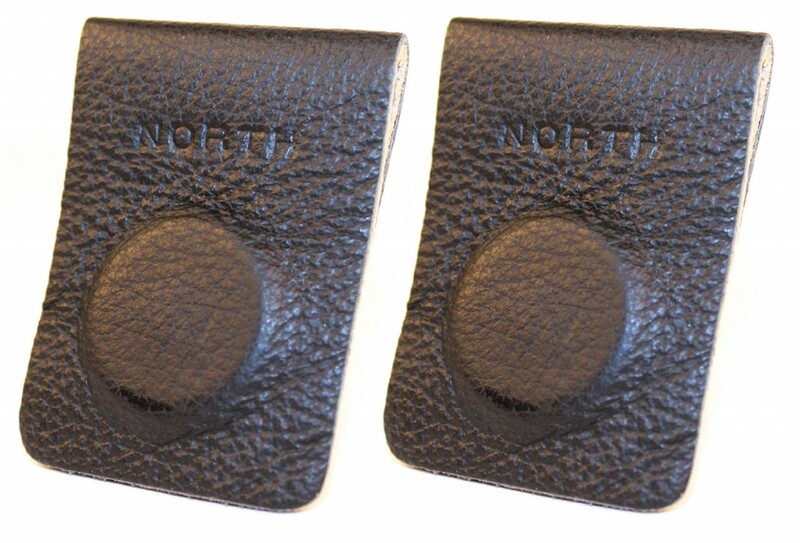 Each clip has the word NORTH imprinted on the solid magnet which is worn facing the body. The Leather clip simply folds over the top of your underpants and cannot fall off. Because leather is a natural material, it is comfortable to wear and will not cause sweating. You can use this amazing Magnetic Therapy ClipTM to alleviate Heart Burn and help with Gastric Reflux. Simply place over the sternum area (breast bone) with the NORTH side of the clip facing the body. I was suffering from a torn shoulder muscle for over 18 months and followed the medical remedies i.e. physio, massage, chiro and even cortisone injection, with very little results. I heard about the magnetic clips and within 5 weeks I am completely healed. No pain at all. I am forever grateful for this miracle result. Thanks Gerardine. I have found a big difference with the clips. I have put three of them on my shorts in the stomach area as I was bloating and burping. It went away very quickly. I also used them on the waist at the back as I get pain in the waist area and it worked. No more pain. In 2015 I bought 2 collars for my dogs.Then 2 clips for me and wrist and knee supports.After years of horses I am now in a lot of pain so I wear them every day and always know when I forget to put them on.My girlfriend just broke her leg coming off her horse so the double pack is perfect for her birthday.Hope she has as much relief as I have had.I also treated myself to a leather wrist band which soon took the pain away. Thanks Gerardine, great,well made products. Click the button below to add the 2 PACK Magnetic Therapy Clip for Back, Shoulder, Arthritis, Sciatica, Period Pain, Gastric Reflux, Heartburn, Menopausal Symptoms. to your wish list.